Blackberry plants spread not just by scattered seed but also through wide-reaching rhizomes only inches below the soil surface. New plants sprout from surviving roots even when the main crowns are removed and destroyed. Overgrazing by goats solves the problem but isn't practical for most homeowners. 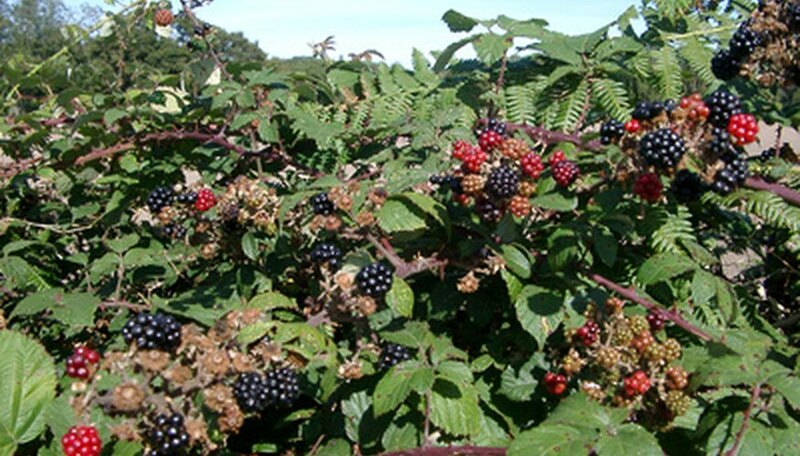 A combination of herbicide treatment and persistent mowing provides the most effective home blackberry control. Mix 8 fluid ounces of 43 percent glyphosphate herbicide in 2 gallons of water. Fill a pump sprayer with the mixture and apply as a foliar spray in late August or September. Wet all leaf surfaces thoroughly, spraying under as well as over the leaf canopy. Wait seven to 10 days or until the blackberry leaves have wilted and browned. Cut the thicket with a power brushcutter or scythe. Cut small clusters of plants with limb loppers--slow but effective. Leave cane stumps no more than 3 inches high. Gather the cut canes with the rake and pitchfork and ferry them in a cart or wheelbarrow to an unused area of the property. Burning eliminates this yard waste quickly. Composting could take several seasons. Fill an open plastic container half full with 43 percent glyphosphate herbicide--undiluted. Use a paintbrush to paint the stumps of the blackberry canes with the chemical. Wet the ends of the canes well, but don't over-apply. Herbicide should not soak the ground. Cut blackberry canes completely back to ground level in late winter. Mow the area regularly during the next growing season. Use a string trimmer if the ground can't be mowed. Don't allow any surviving canes to leaf out and nourish the roots of the thicket. Repeat the chemical treatment in late summer or fall if any clumps of blackberry canes escape the mowing. Complete eradication could take two or three years. Removing canes by digging out clumps and cutting back new growth persistently is possible, but labor intensive. Control thicket expansion by regular mowing of the surrounding area, coexisting with the thicket rather than completely eliminating the plant. Enjoy the berries. Spray blackberries after fruiting to prevent sickening children or wildlife browsing the berries. Spray late in the season to ensure that chemicals sink deep into the plant's root system, or the treatment may not be effective. Wear gloves and goggles when working with blackberry canes to avoid injuries from thorns.